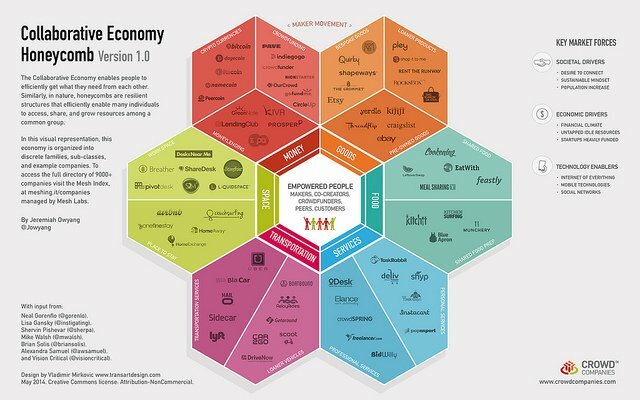 You are here: Home / associations / What does the collaborative economy mean for associations? I’ve been reading and thinking about the collaborative economy for a while now, and of course can’t help but wonder what it means for the association industry. Never heard of “collaborative economy”? Jeremiah Owyang defines it in this post: “the Collaborative Economy enables people to efficiently get what they need from each other.” Going by that definition, I’d say the association world definitely has something to worry about. Think about it–what products/services/functions do associations provide that fall under the “people can efficiently get this from each other” umbrella? Events–one of associations’ biggest sources of non-dues revenue is events and tradeshows. What happens when people are no longer in the market to purchase products because they prefer to borrow them–will those vendors still exhibit at tradeshows? Or will the exhibitor mix shift to companies that enable product and/or service sharing? The thing about these new companies is that they are more likely to use social media and word-of-mouth advertising than paying an association for booth space–they are experts at getting the word out without a middle-man. To old school companies, a booth at an industry conference was a great investment and seen as the way to get their product/service in front of potential customers; not so much in the collaborative economy, I’d speculate. And from the non-expo standpoint of conferences, now that people can self-organize and form their own personal learning networks both local and via social media, will conference attendance become a thing of the past? The whole point of the collaborative economy is the crowd becoming the company, therefore the need for middlemen like organizations to put on conferences is presumably decreased if the crowd can self-assemble and put on their own conferences or collaborate via Hangouts or other technologies. Still, people love face-to-face…but will they love face-to-face when they have to pay for it themselves versus their employer paying registration, travel and per-diem? Products–this one is a no brainer, at least in my opinion–if people start borrowing instead of buying, there potentially goes another big source of non-dues revenue. Especially books and publications. Do students purchase textbooks now, or borrow them? Will they purchase your association’s books or borrow them? If people are buying less of everything, they’ll probably want less of the stuff your association sells too. Journals–Associations own the scholarly journal space, though, right? Nope–not anymore. There’s PLOS One, where authors can pay to have their work peer-reviewed and published. There’s ResearchGate, where researchers can connect with other researchers to share papers, ask and answer questions and collaborate. There’s FundRef, which helps scientists identify who is funding research, thereby potentially cutting out the need for foundations and associations. Lots of disruption in this space, and potential for a huge traditional member benefit of scientific and medical associations to be vastly diluted. Continuing education–I am no expert in continuing education, but I know enough to know that some professions require a certain number of CE hours per year or other term to maintain certification or other professional credentials. I do know, though, that education models across the spectrum are being disrupted–from MOOCs to self-directed learning and alternative credentials–there’s lots of disruption happening there, and I can’t imagine it won’t impact revenue associated with continuing education in the long run. At a minimum, it will change people’s technology expectations and associations will need to keep up if they want to be able to compete in that space. Remote working–while this isn’t a dues thing, I think it has the potential to disrupt the association space in terms of staffing and management at associations. 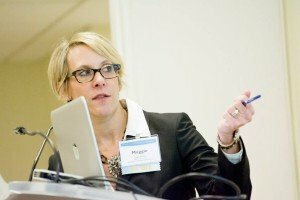 How many of you association professionals work for associations that don’t allow telecommuting at all because the management team or executive director think that in order to be productive, everyone needs to be physically present at their desk for 8 core business hours a day, five days a week? Because everyone knows that given the chance to work from home, basically all employees will just slack off and do nothing. As someone who has worked for or with a dozen associations and interviewed at dozens more, I can tell you that remote working is a concept that very few associations have embraced. Meanwhile, they continue to spend millions on physical space and equipment–not to mention coffee! As skillsets change and what’s needed in terms of employees who know how to market to and serve members who embrace the collaborative economy, I think there will be a shift in people willing to work in one physical location 40 hours a week. In order to provide a member experience that people are still willing to pay dues for, associations will need to retain smart employees with new skills and new expectations in terms of work/life balance. The good news is that associations could potentially save tons of money letting go of their physical spaces. The bad news is that the crop of managers who think it’s impossible to remotely manage employees are going to have to figure out how to hire people they can trust and just let go of old notions of desk-dwelling employees. What other aspects of associations do you think could be impacted by the shift towards a collaborative economy?